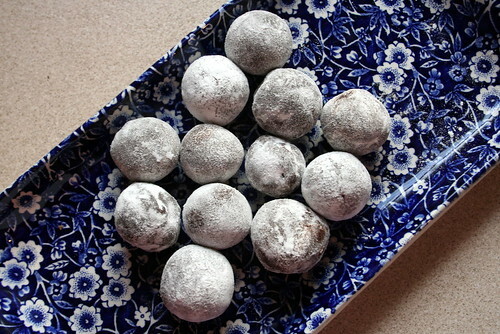 Twenty Cent Mixture: Vegan Truffles! Now these are seriously more-ish. And all they contain is chocolate, cashew nuts and water, plus icing sugar to coat. How's that for easy? Back in my non-vegan days I made similar truffles using cream, butter and chocolate and I honestly think these taste just as good, if not better. The recipe is here at Vegan Zest for Life (another great NZ vegan blog), and the only real kitchen equipment requirement is a grunty food processor or blender to ensure you get the cashews and water blended really smoothly. I made a one-third batch to try out the recipe and I used my favourite dark chocolate, Whittaker's Dark Ghana, which, with 72% cocoa mass, turned out to be too rich. Next time I'll use their Bittersweet Dark chocolate (only 47% cocoa mass) and maybe add some flavourings (mint or orange maybe) and try out some different coatings (chopped nuts, chocolate hail, coconut). I can see this being a great go-to recipe for Christmas thank-you gifts this year. Looking good Louise!! Love that dish, too. Let me know how it goes with the flavourings.